Imagine my surprise dear friend (s)--I hesitate to think that there may be only 1, perhaps 2 followers, who will be reading this since I've been such a pitiful poster. No excuses....just the fact that when life is busy something has to give--and my blog was it! I'm anxious to start creating and posting projects with the awesome products from our new 2016 - 17 catalog. 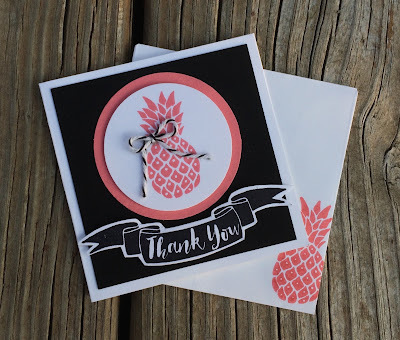 My upline and I hosted a "New Catalog" party this past week--here's the make and take that I had for my stamping friends--a little 3 x 3 card using the "Pop of Paradise" stamp set....so cute! The little pineapple is adorable--and really trendy right now! The pineapple is stamped in one of our new in-colors--Flirty Flamingo. Gotta love the names of the colors don't you? Ha! What a fun job it would be coming up with them! I'm trying to determine a regular blogging schedule to get into this summer and hopefully maintain....so you'll be hearing from me again sooner than 4 months! Cute card. Flirty Flamingo is my favorite new in-color.